One thing that I wanted to emphasis during this holiday season was "paying it forward" I guess I'm not sure that's the right wording but I wanted some of my gifts to be something that wouldn't only benefit the recipient but also keep the gift of giving moving forward. Here's a few more cards that I've created to give away as gifts. 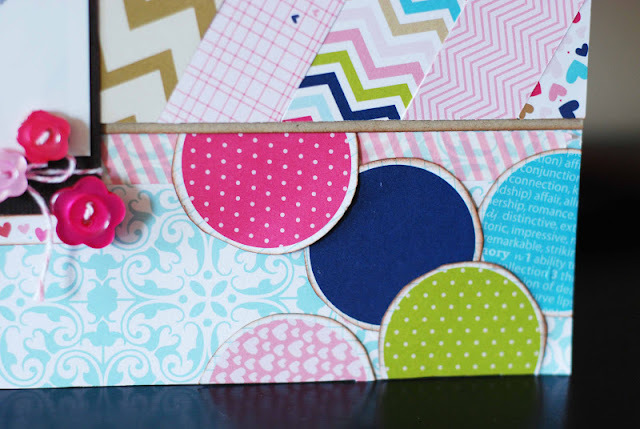 These are very simple cards but I hope that they will make someones day! Thanks for taking time to visit today. Wish me luck...I'm off to fight the crowds and finish my Christmas shopping today. I neglected to share my most recent Bella Blvd project. 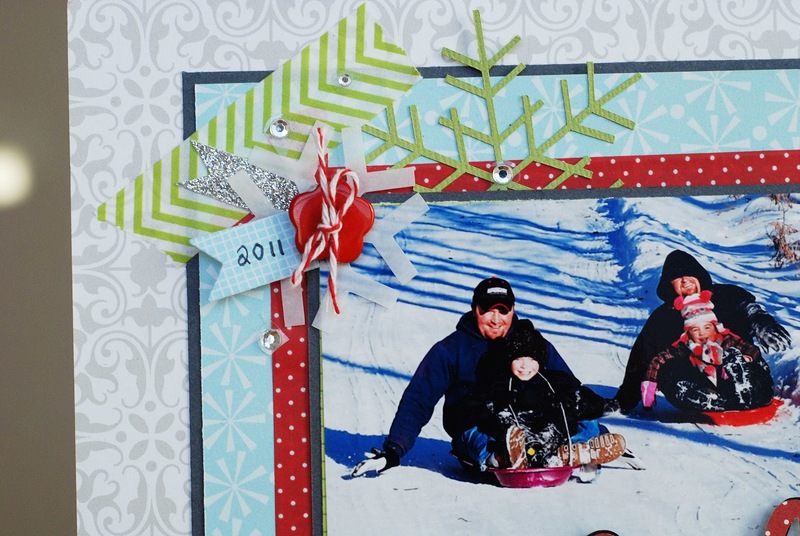 This layout is already one of our family favorites. I have it standing on an easel in my living room. 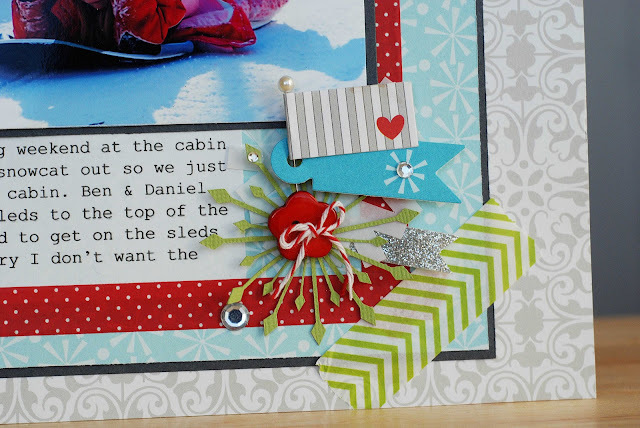 My kids are always talking about the great time we had sledding at the family cabin Thanksgiving weekend 2011. 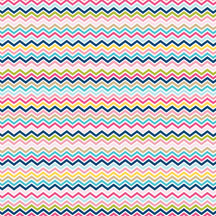 My assigment from the gals at Bella Blvd was to create a layout using this image as inspiration. 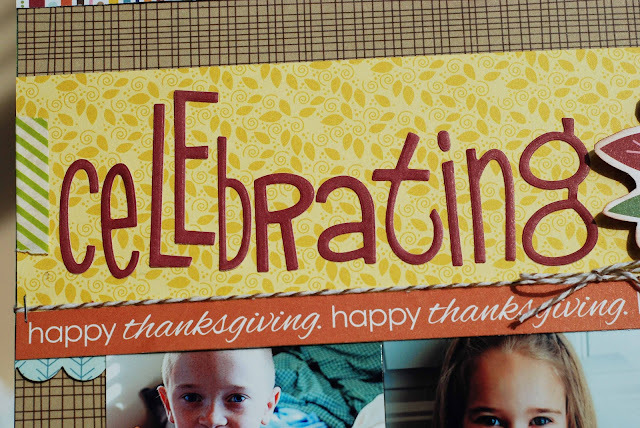 Today I also tell you a little bit about the design and why I chose the placement for my embellishments and title. 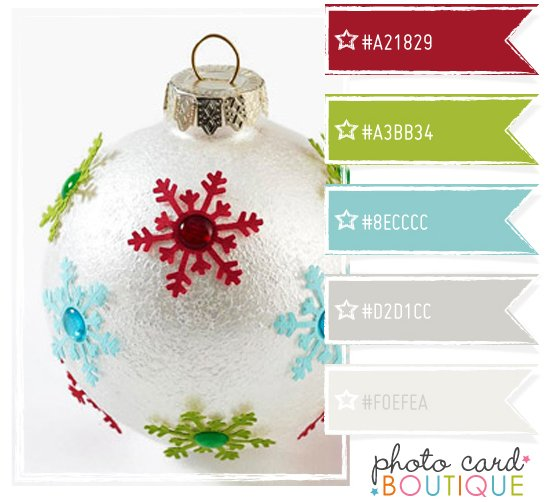 I chose to create my layout based on the colors and the snowflakes in the image. I started the layout by cutting the title using my Silhouette. 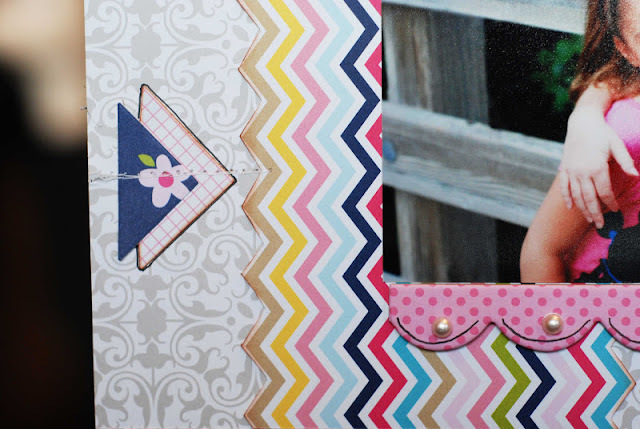 Because I had four smaller photos I wanted an element to stand out and draw attention to the photos on my page. 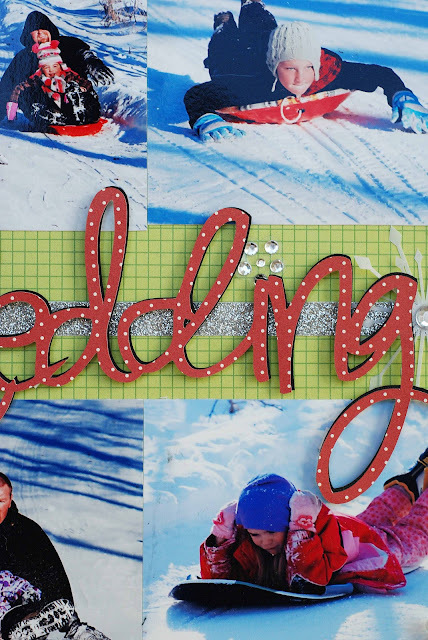 I used some glitter tape by American Crafts behind my title to add a little sparkle. 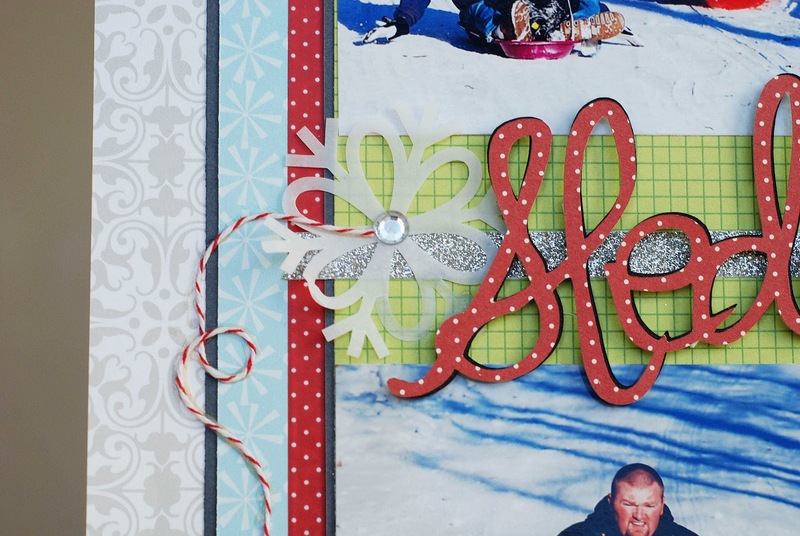 On either side of my title I added some die cut snowflakes with some bling in the center. I added the bakers twine so there was a little bit of movement and so all my lines weren't straight. I created two embellishment clusters using Bella Blvd embellishments and die cut snowflakes. These clusters are in the upper right hand corner of the page and the lower left hand corner of the page so that your eye will move across the page and make the photos stand out in between. Here's the whole layout. 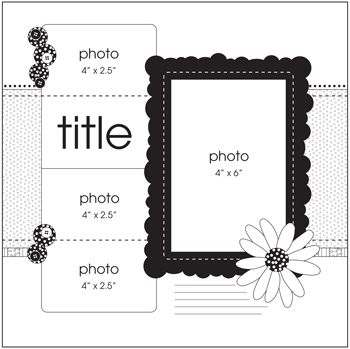 I know that I'll have to create 2 more of these layouts so that each of my kiddos will have one in their albums. Hello, I'm glad you stopped by today. 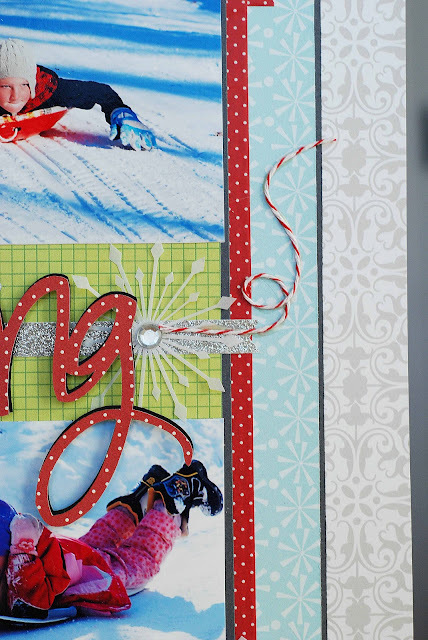 We're deep into the holiday season and that means Holiday Parties and gift exchanges. 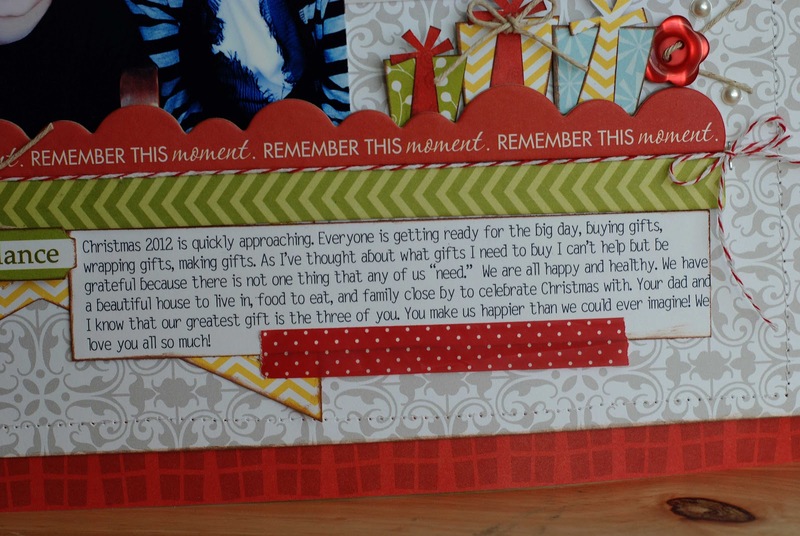 This year for our gift exhange gifts I wanted to give a gift that would "pay it forward." I decided to give a set of cards with envolopes to exchange with the hope that each card would get sent out and brighten someones day. 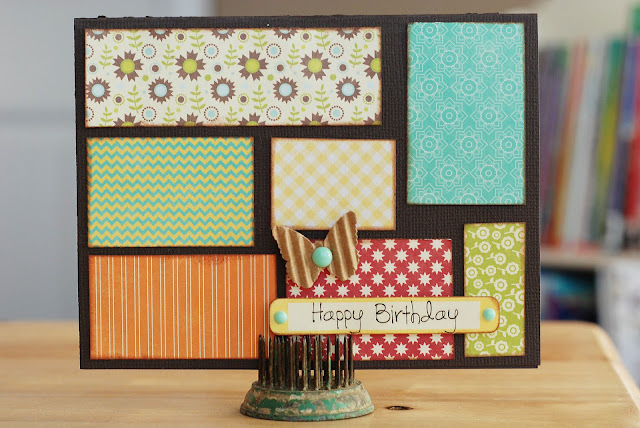 This card is a Happy Birthday for an adult. I used a Bingo Card from My Minds Eye for the base and built up from there with Washi tape, die cuts, chipboard, tags, rubons, and gems. 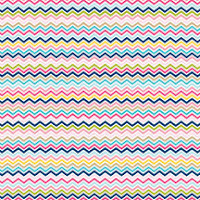 I love all the dimension and different colors and patterns that bring it all together. Thanks for stopping by. I'll have lots more cards to share with you in the coming days. Happy Wednesday everyone! 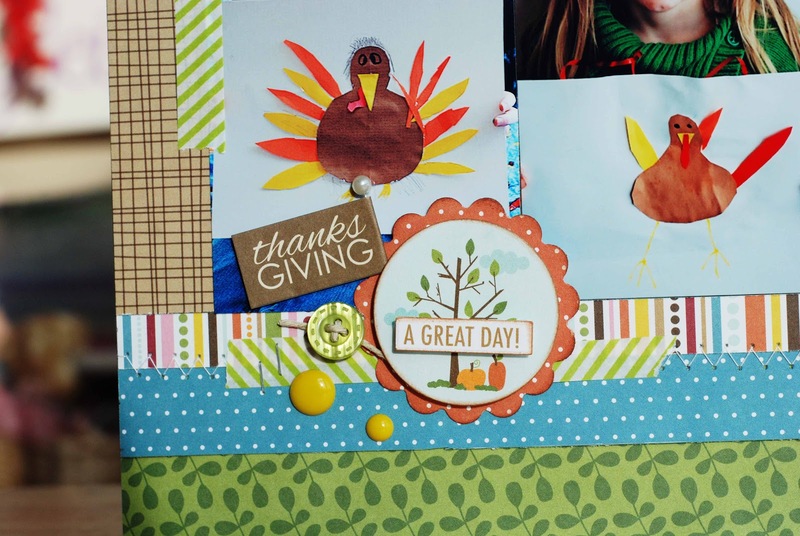 It's been way too long since I updated my blog and way too long since I had a layout up on the Bella Blvd blog too. Today the wait is over. I have BOTH! 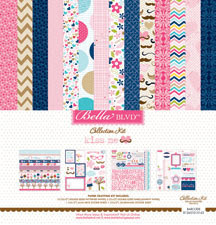 I created this layout using many different Bella Collections. 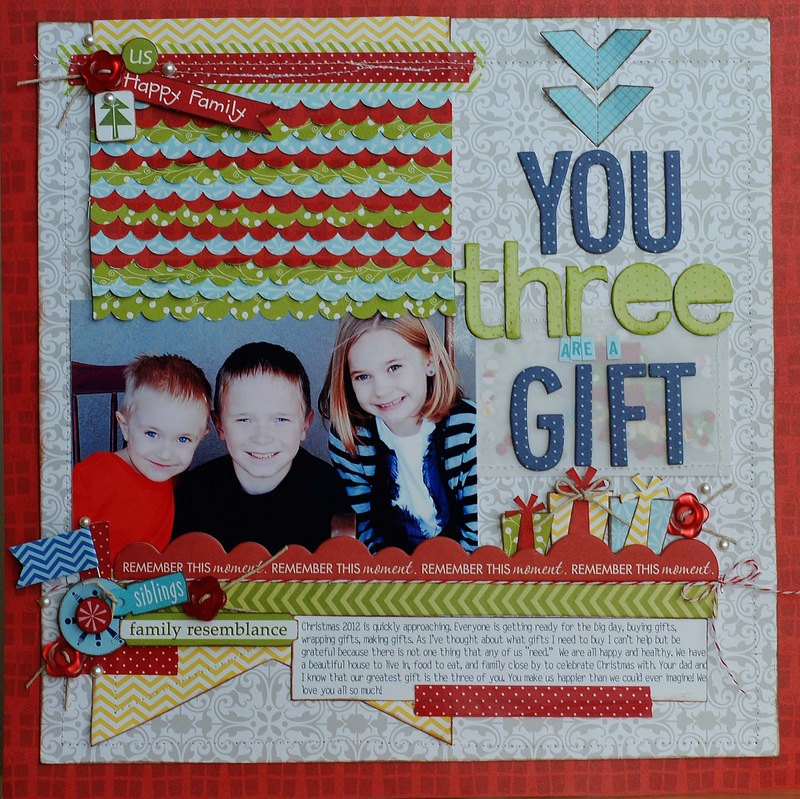 This layout is Christmas themed centered on how I feel about my 3 children. I wanted to emphasize that we don't need anything this Christmas and how blessed I am to have these three great kids. Christmas 2012 is quickly approaching. 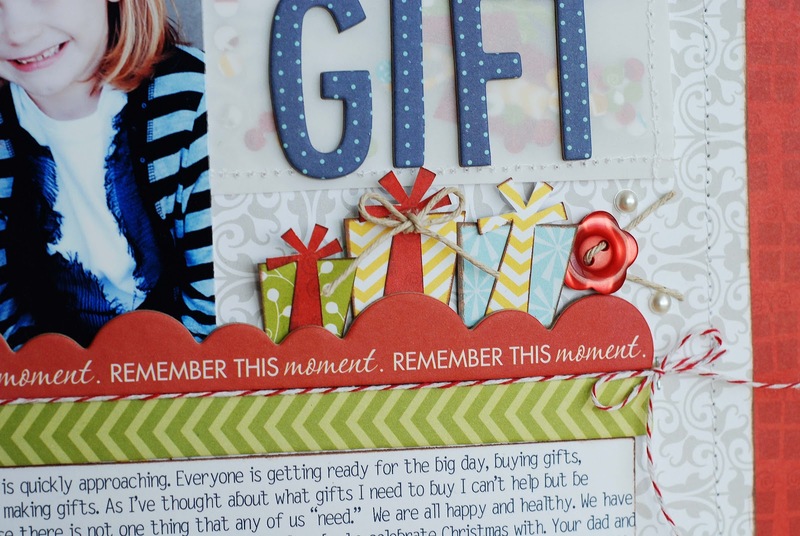 Everyone is getting ready for the big day, buying gifts, wrapping gifts, making gifts. As I’ve thought about what gifts I need to buy I can’t help but be grateful because there is not one thing that any of us “need.” We are all happy and healthy. We have a beautiful house to live in, food to eat, and family close by to celebrate Christmas with. Your dad and I know that our greatest gift is the three of you. You make us happier than we could ever imagine! We love you all so much! There is a lot of patterned paper and texture on this layout. I created a vellum pocket under part of my title with confetti and some die cut gifts. 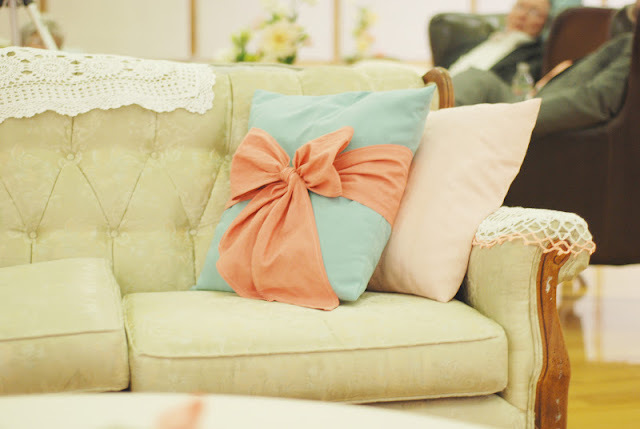 I cut the small gifts with my Silhouette. 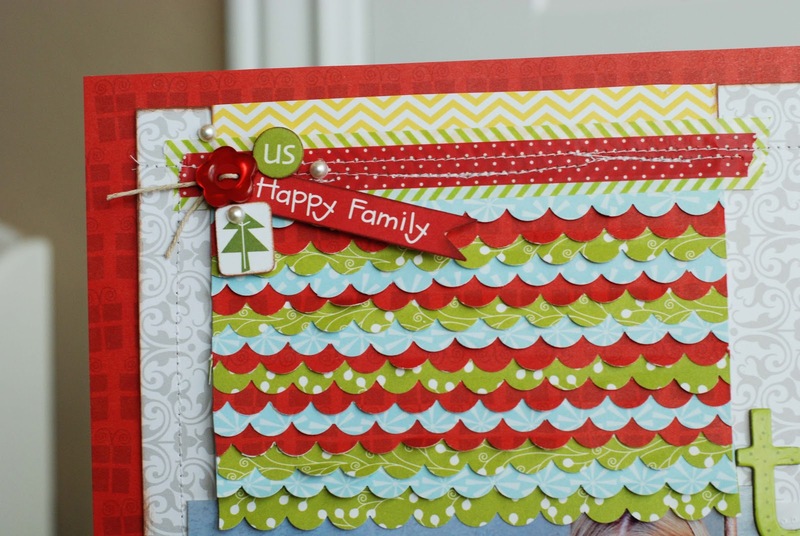 The border strips are punched and stacked together. I love using Bella's stickers, buttons, and flags to create embellishment clusters. Good Morning Everyone! I have a layout to share with you today, I created it with the new Bella Blvd Kiss Me collection. I adore this collection. 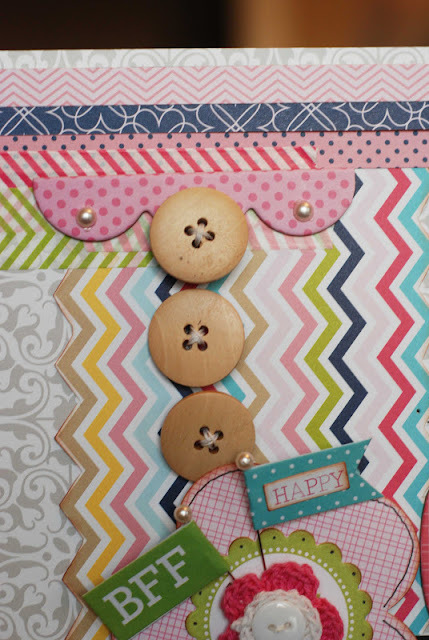 You'll see a lot more projects of mine from this collection because I'll use every last scrap from this collection. 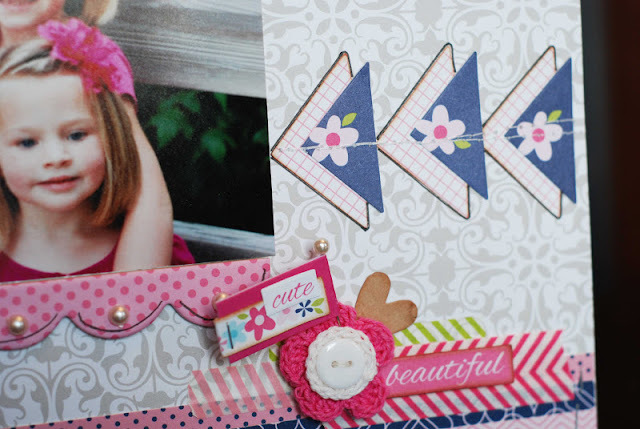 This layout is about my daughter and the silly smirk she has on her face in the photo. 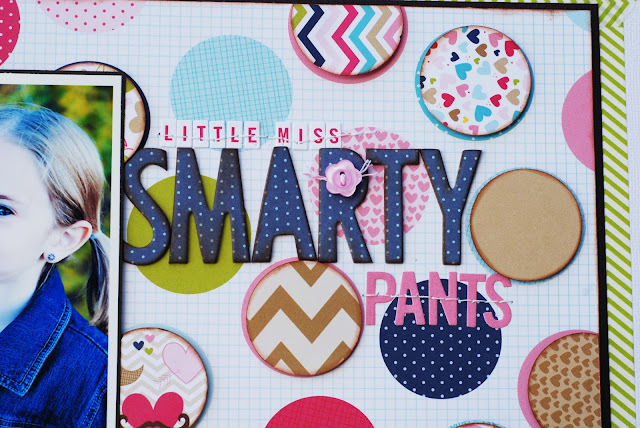 Sometimes she gets that sassy little look on her face and we call her "little miss smarty pants" Even though this is a collection geared toward Valentines day it's so versatile that I use it for everyday layouts as well. This little lady is home from school with me today. She's not feeling well. Poor little thing! Although, I can't say that I'm not happy to have her home with me. I miss her tons when she's gone to school! I created the background for this layout by layering the circles. 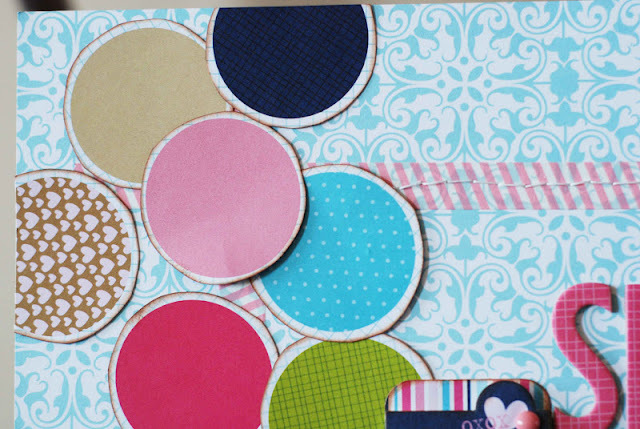 I cut out circles from other patterned papers in the collection and layered them on the circles that were layered on the page. I left some circles without layers so there was room for my title. 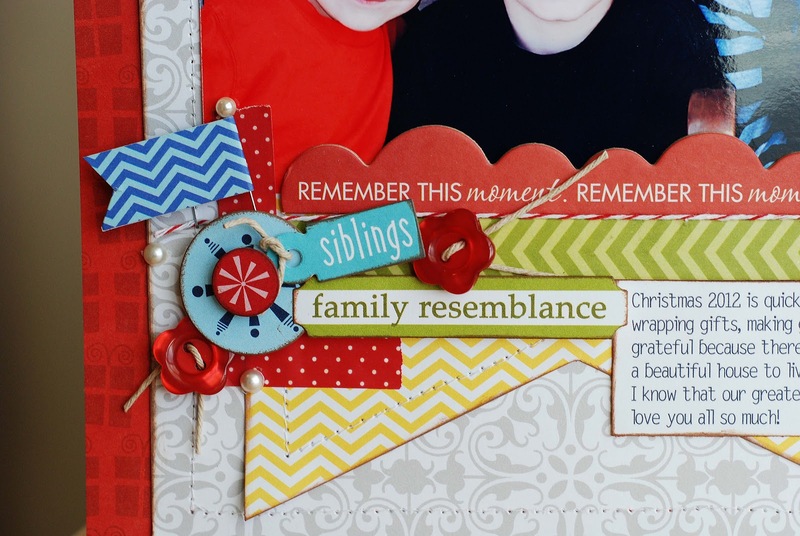 I bordered the focal point of my layout with decorative tape....I love that stuff! I finished the layout by embellishing with some enamel dots by My Minds Eye (LOVE those little things) stickers, buttons, and more decorative tape. 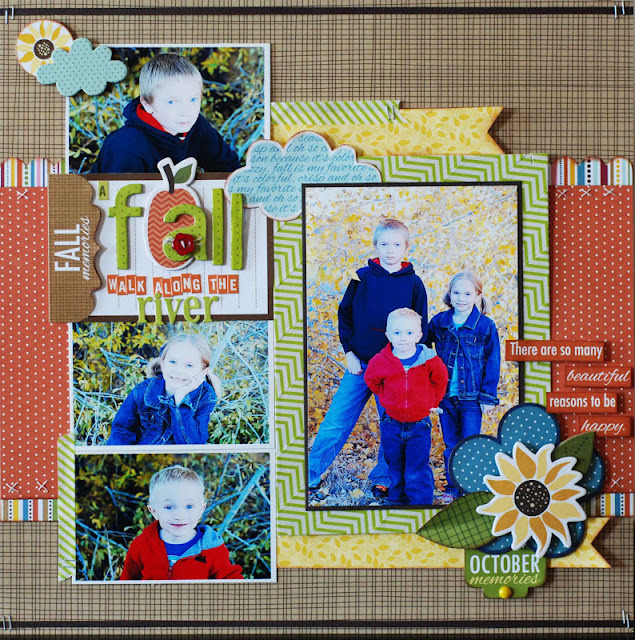 And here's the finished layout! I love how this one turned out! 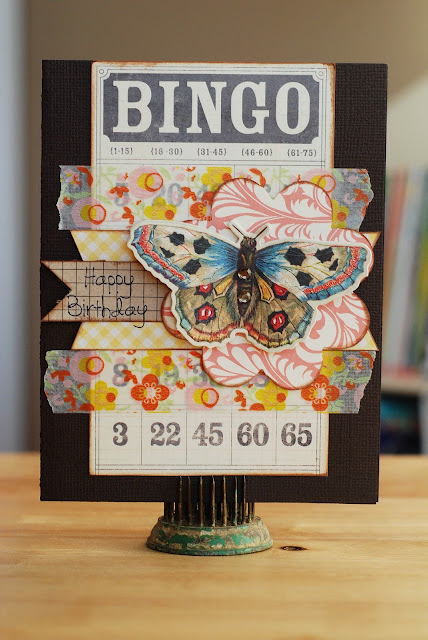 It's my birthday and I have an adorable layout to share with you today. 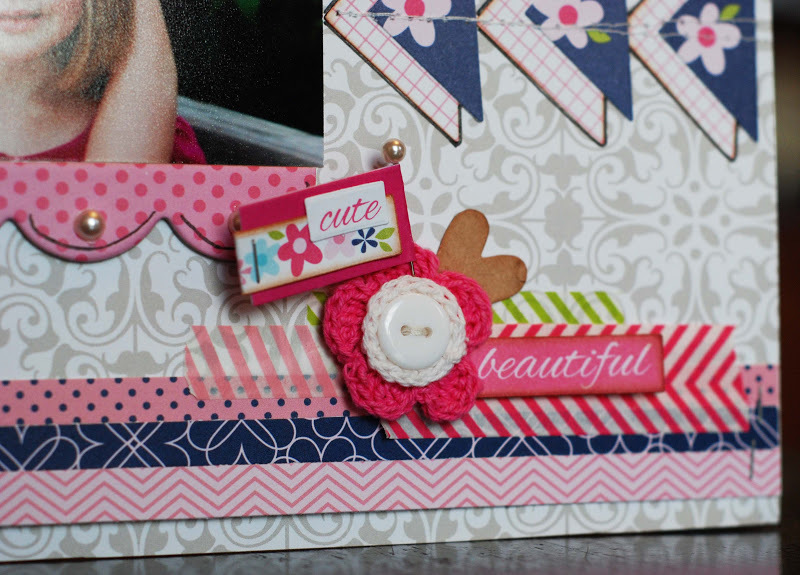 Bella Blvd's Buttons...flags...Kiss Me Collection are all on todays layout. I chose to use a photo with 3 of my dad's granddaughters. I snapped this photo while we were taking back to school photos. It quickly became my favorite and I knew my dad would love this photo. These little girls have their Grampy wrapped around their little finger. I love Bella's wood buttons. 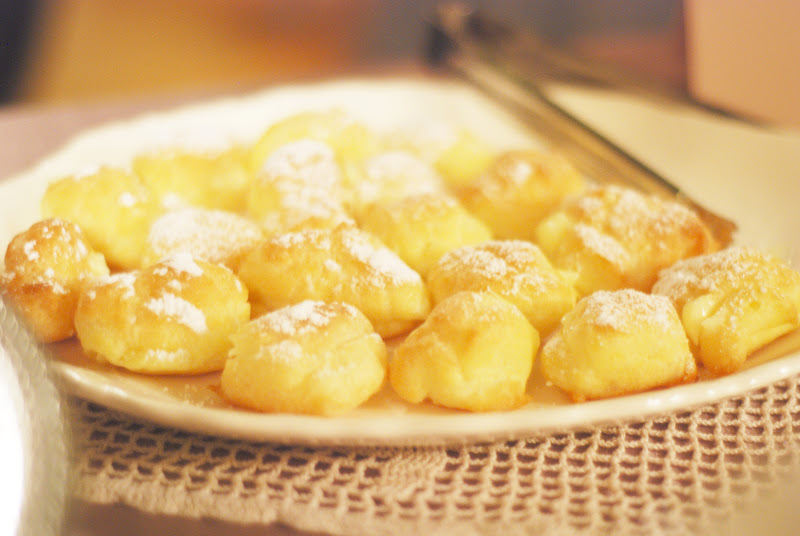 They are the perfect size. I used the photo corners to make arrows that direct the eye to the photo. The stitching on them adds an extra layer of detail. Here is the completed layout. 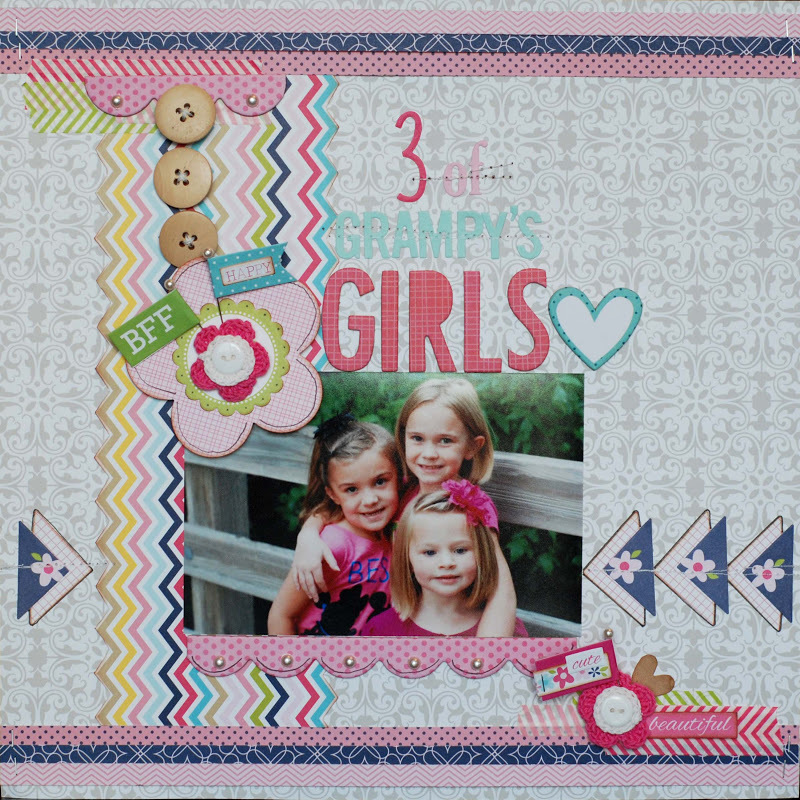 I LOVE these 3 little ladies...and so does their Grampy. Thanks for taking the time to stop by. I appreciate it tons and tons! Have a great weekend! Hi Everyone....I'm back! I've taken a break from blogging for a little bit. I've been busy helping get ready for my little brother's wedding.The wedding was beautiful. I've never been to a wedding like that. Kayla (my new sister-in-law) designed this wedding herself and she did an AMAZING job! 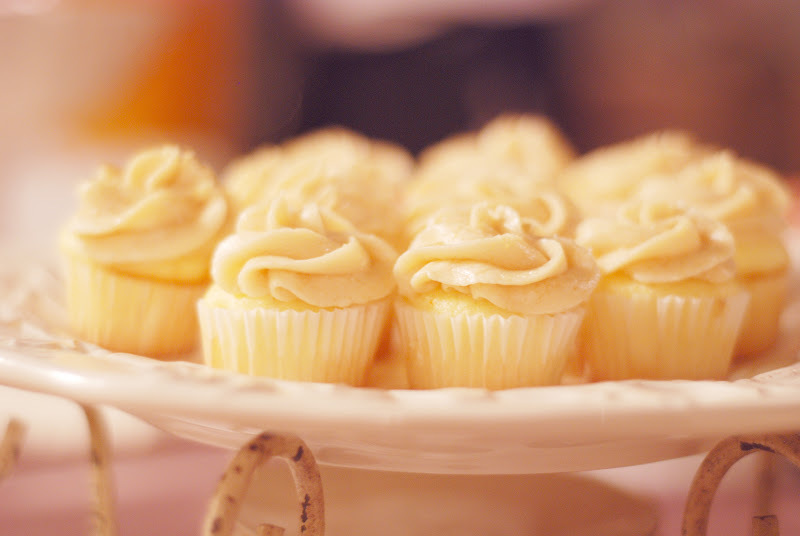 I'm so excited to show you a few of the photos. I wish I could have taken more of the whole reception it was stunning. 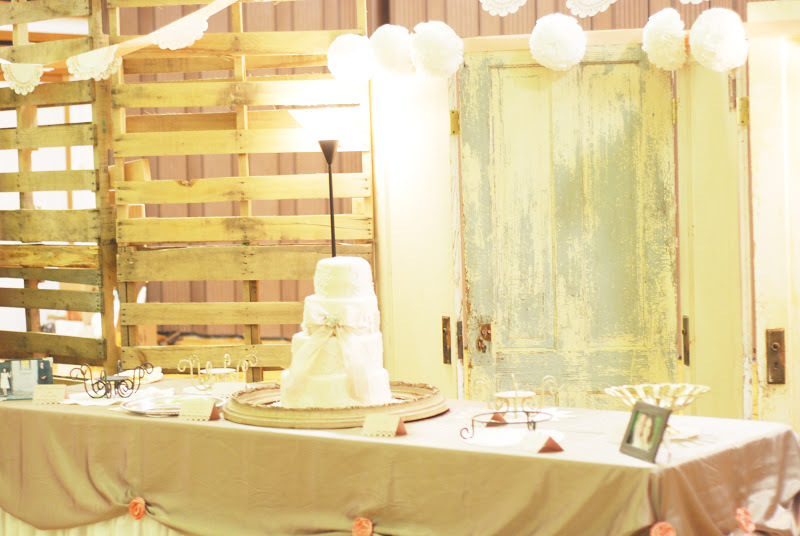 She had a vintage eclectic theme and she did an outstanding job, right down to the last detail. 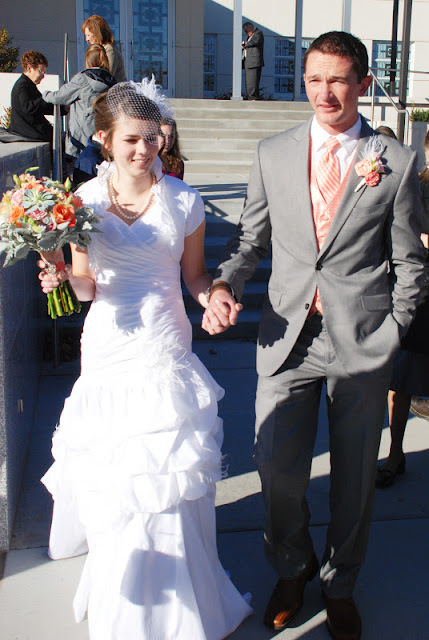 Here a few photos from their special day. I can't wait to get some more photos from their photographer. 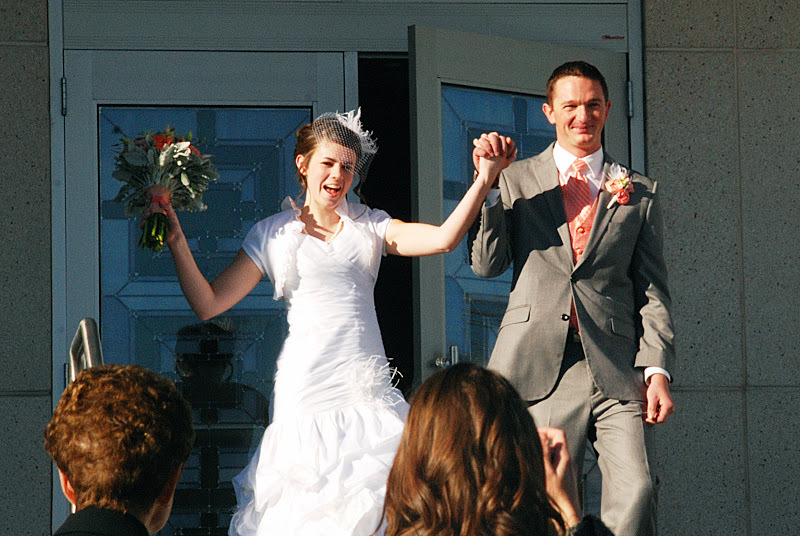 They are so excited to be married! I am so happy for them! Good morning everyone! 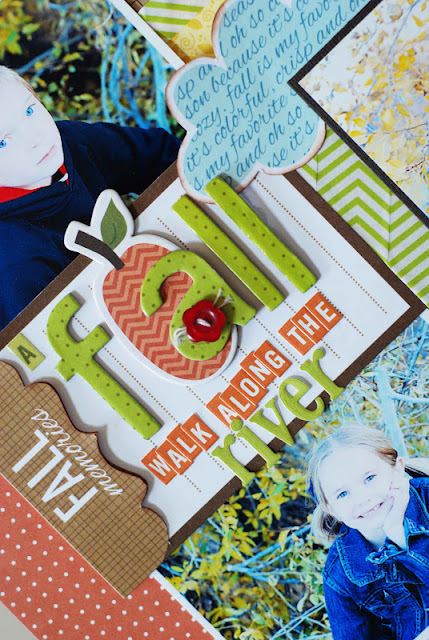 I have a layout to share with you today featuring the new Kiss Me collection from Bella Blvd. It's one of the featured projects on their blog today This is the new Valentines collection that will start arriving in stores the first part of November. 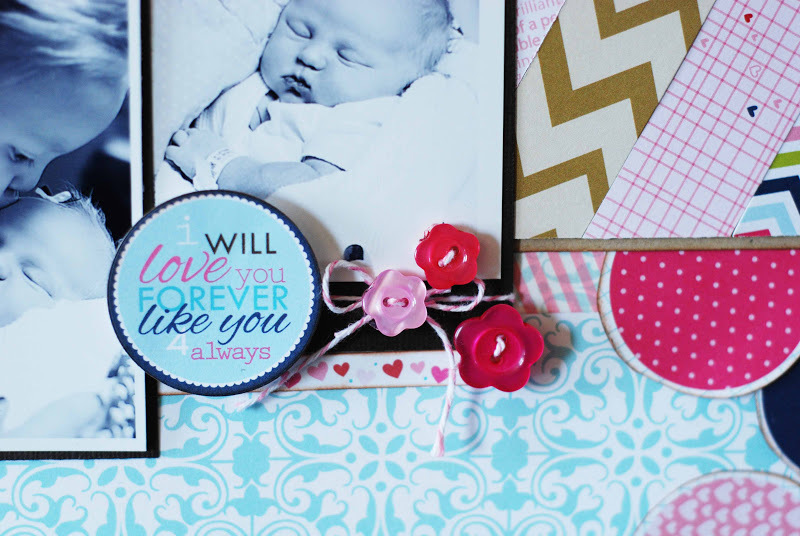 This collection is adorable! My favorite thing about this collection is the versatility. You can use it for everyday layouts or Valentines projects. 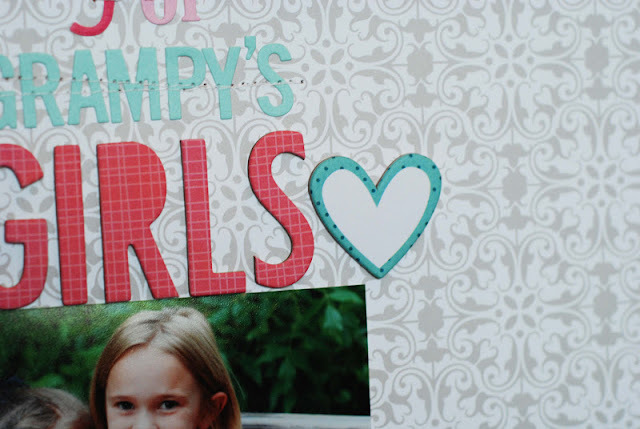 I did a layout about my nieces. The photos melt my heart. I love these little ladies so much! I love the huge polka dots in this collection. 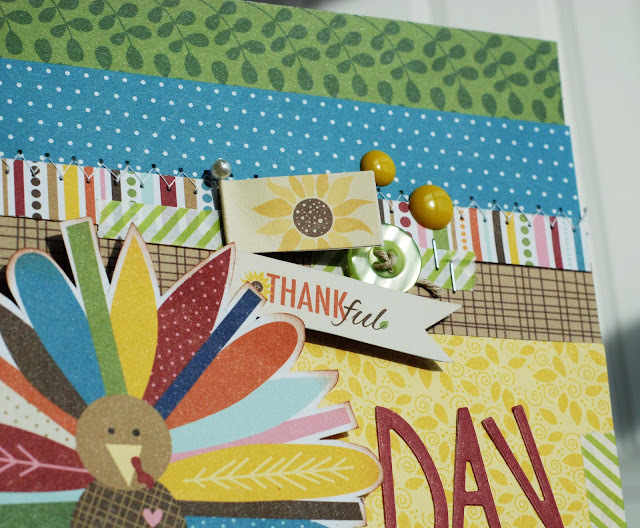 I've also used the polka dots in the Thankful collection in a similar way. 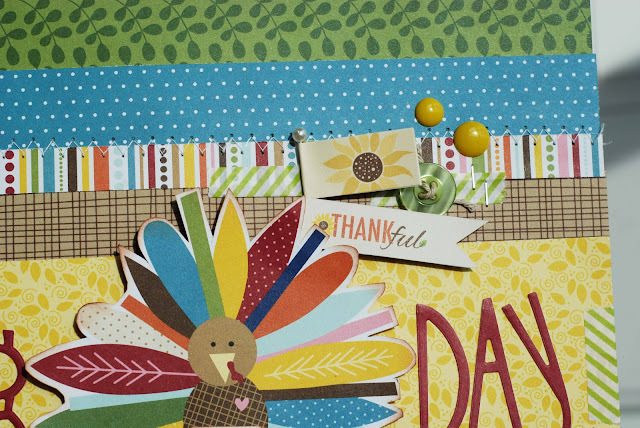 I thought this sentiment was perfect for this layout. 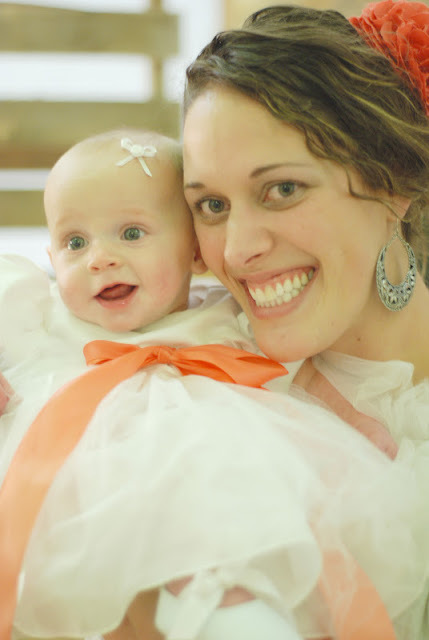 Isn't that the most precious photo of my two lil ladies! 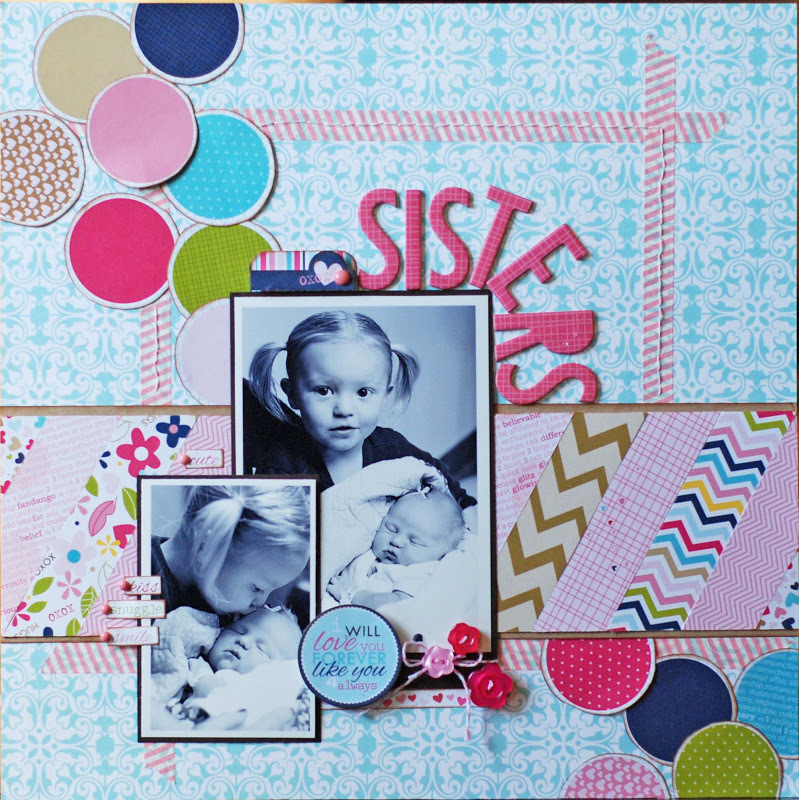 And here's the completed layout! 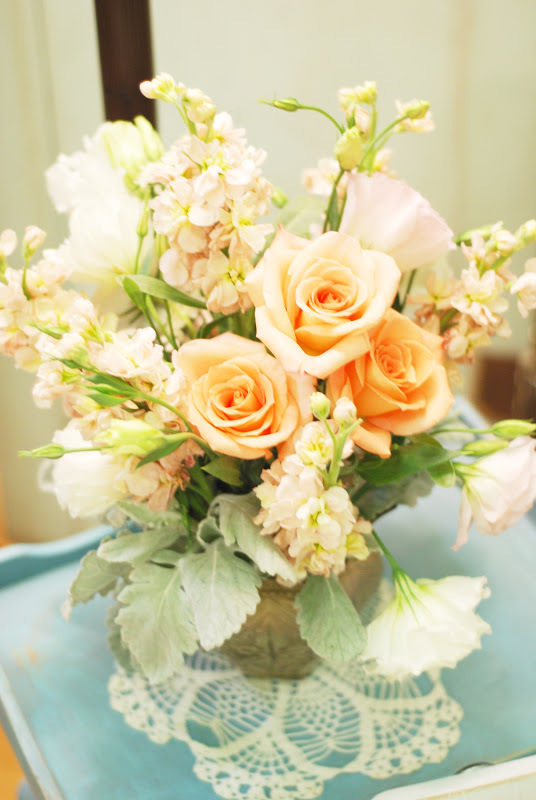 Thanks for taking time to visit my blog today. Today is the day...Kiss ME! Today is the day! 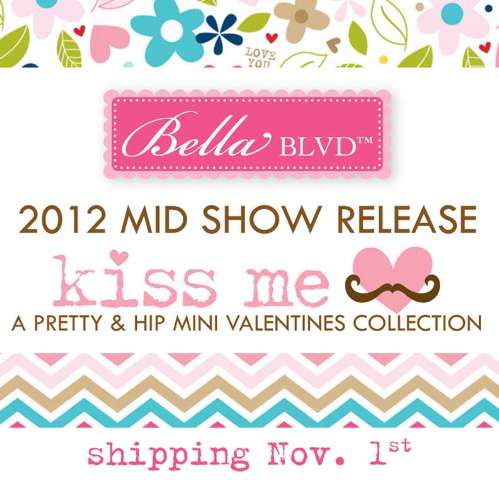 Bella Blvd is introducing their new Mid Season release. Kiss Me. The man in brown brought me a box containing the goodies from this collection on Monday so it's laying on my desk, I've almost finished my first project. This collection. 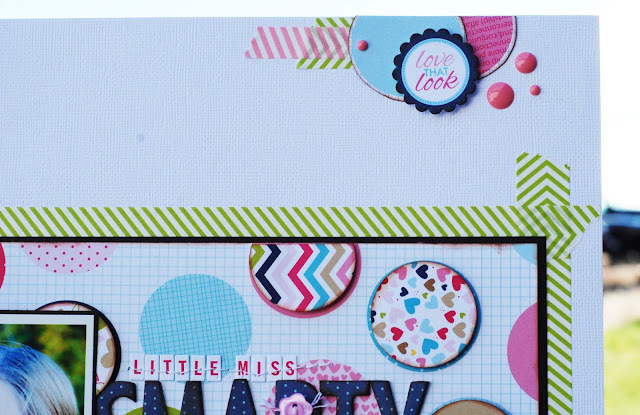 is.AMAZING!The layout I've started will be on the Bella Blog in a few days. I wanted to show you a couple of my favorite papers from this collection. 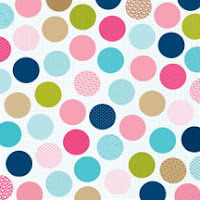 I LOVE these big colorful polka dots! This cheveron is stunning in real life. The color pallet for this collection is unique and so much fun! 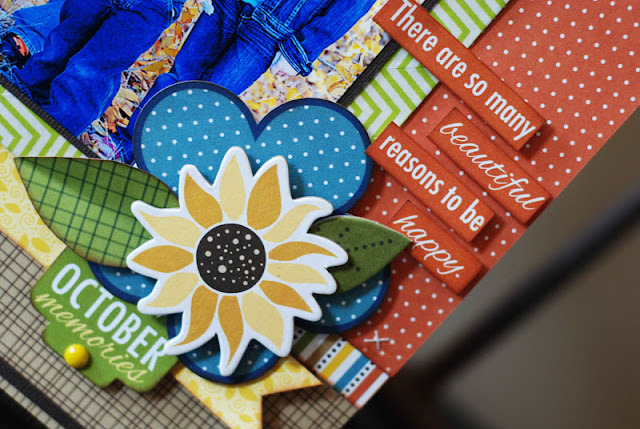 The flowers, mustaches, and chevrons will make your fingers itch to create! So, guess what?!??! Over on the Bella Blvd blog you can win it before you can buy it! Hurry, get your entry in :) Trust me. 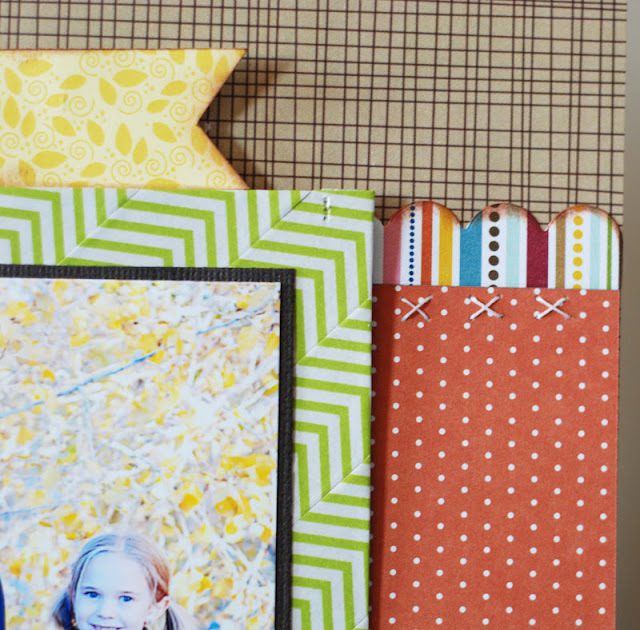 You'll want this collection in your stash!